Microsoft released security updates for supported versions of Windows and other company today on the April 9, 2019 Patch Tuesday. Updates are provided in various ways: via Windows Update, as direct downloads, and through Enterprise updating systems. Our monthly overview of Microsoft's Patch Day offers detailed information on updates, additional information that is relevant, and links to supported articles. It starts with an executive summary, and is followed by the statistics, the list of released updates, known issues, and direct download links. You can check out last month's Patch Day in case you have missed it. As always, it is recommended that systems are backed up before new patches are installed. Note that some users had troubles installing the last cumulative update for Windows 10 version 1809; you can check a possible fix for System Service Exception blue screens here. Attention: Reports of Windows 7 and 8.1, and Server 2008 R2 / 2012 R2 machines freezing after update installation. Is apparently related to Sophos products, only solution right now is to uninstall the update. Check out this article for more details. You find a list of all released updates for Microsoft Office -- security and non-security - here. Windows Updates get installed automatically on Home systems by default. You can block or delay the installation of updates on these systems. Click on the "check for updates" button to run a manual check. You may use third-party tools like the excellent Windows Update Manager or Windows Update Minitool to download updates. smh… this passes as tech journalism these days… Regardless of what some.. self proclaimed, who apparently knows little to nothing about what he’s writing about, says, Microsoft will not scrap the 1809 branch. It’s a LTS and Server release. 1507, 1607 and 1809 is what brings Microsoft the income. Any other Win10 release insignificant. The fact that home users had/have problems with either of these three releases means nothing to them. I don’t know how the mere mortal aka consumer versions of Win10 still work update-wise, i.e Home/Pro/Education, but if you’re able to disable feature updates do it, and stay on a LTS equivalent build until the next one comes. If you’re enough tech savvy, just disable WinUpdate and apply the patches manually once per month, they are a 1,2GiB file, at least for LTS1607, containing all the fixes from day one until present. I guess MS stole this idea after had seen how wonderful Simplix Update Pack works on 7. You should better you reading comprehensions. No one said Microsoft is scrapping 1809, just that Microsoft has stopped PUSHING 1809 to home, enterprise.. PCs that didn’t it by now. Everyone is free to download and install 1809. It is still there. Then it means the title is clickbait, which is even worse. According to a very recent ZDNet report, the FCC stated that in 2018, only 24.7 million Americans do not have Broadband Internet ( = download speed of 3Mbps to 25Mbps) but M$ countered that from her Windows(= Win 10/8.1/7) Telemetry & Data collection or spyware, a whopping 162.8 million Americans out of 300+ million in total US population do not have Broadband Internet = about 50%. ……. Maybe, that is why M$ is throwing the towel on Win 10 1809, ie the FCC had screwed up with her data. Nevertheless, after knowing the above data, M$ still had the nerve to continue forcing Win 10 users to be auto-upgraded every 6 months or every year which required the users to download a humongous 4GB upgrade file. ……. This means, if the hapless Win 10 user has an Internet plan of 2Mbps, it will take his/her Win 10 computer about 6 hours to download the upgrade file. There will be the risk of corrupted file transfer during the 6 hour long download = borked computers. The inplace upgrade itself may encounter incompatibilities = borked computers. ……. Tens of millions of American Win 10 users who do not have Broadband Internet have been suffering at the hands of M$ and her forced auto-upgrades. Shouldn’t M$ be charged in US Federal court for knowingly harming millions of American computer users.? It is general knowledge that an OS upgrade is better done via a clean install, instead of an inplace upgrade which is fraught with problems. Hence, most computer users prefer to do an OS upgrade every 3 to 5 years, ie by doing a clean install or buying a new OEM Windows computer. Some even prolong the upgrade to every 10 years, as per Windows EOL. Personally, I think it is insane for ordinary computer users to do an OS upgrade every 6 months, whether via a clean install or an inplace upgrade. Even smartphone users are not forced by Google or Apple to do that. M$, in her pursuit of maximum profit$, imposed forced auto-upgrades every 6 months or every year on Win 10 users. M$ did this not for the benefit of the users or for any other altruistic reason. Similarly, Ubuntu has Rolling Releases of new OS versions every 6 months with an EOL of 9 months, eg Ubuntu 16.10, Ubuntu 17.04, Ubuntu 17.10 and so on. OTOH, Ubuntu also has LTS Releases of new OS versions every 2 years with an EOL of 5 years, eg Ubuntu 14.04, 16.04 and 18.04. Both these Releases are not forced auto-upgrades for Ubuntu users, ie they are optional. ……. Rolling Releases are mostly used by tech-geeks, alpha-testers, experimenters, bleeding-edgers, trend-followers, software developers, new computer buyers, etc. I did not see Martin’s advice above until after successfully installing KB4493509 and 3 others via Windows Update for my Windows 10 1809 x64 Home laptop. No observable problems. You’ve got the links for Windows 8.1 and Windows 7 SP1 mixed up, so that I get the versions for Win8.1 instead of Win7 if I click the links. Under Windows Security Updates – Windows 7 Service Pack 1 and Windows 8.1 you have the KB numbers listed in reverse. The Windows 7 are listed under Windows 8 and vice versa. Also, you have the same Windows 7 KB4493448 and KB4493472 listed again under Other security updates. Was that deliberate, none of the others listed above are duplicated in that section so it wasn’t clear to me, or is there some other Windows 7 other security updates that were meant there? This update makes my W10 1809 lost video files associations, Chrome flickering has turn back. Very queer if you ask me. But perhaps quite logical to Microsoft. 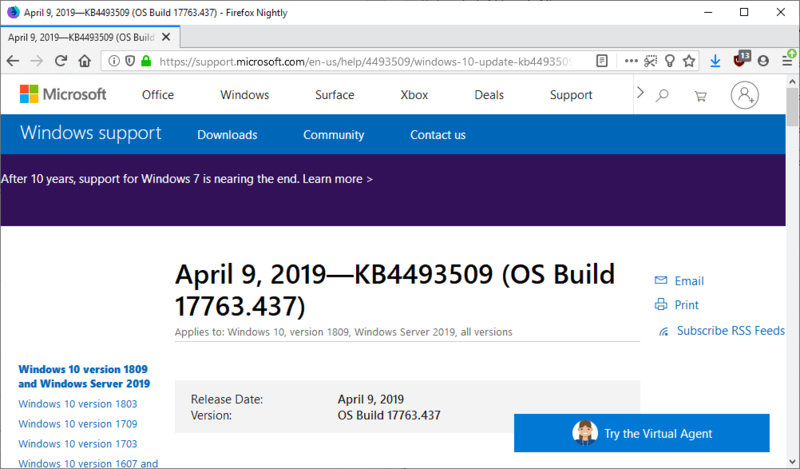 The first time I installed KB4493509 for Windows 10 Home, it said I had build 17763.379. I updated again, and lo and behold, KB 4493509 appeared again. It installed, apparently without problems, but this time I had build 17763.439. Reverted from kb4493472 on Windows 7 x64. USB mouse didn’t work, SENS service ‘couldn’t be found’, rebooted via Ctrl-Alt-Del and keyboard, got fed up waiting for boot screen, ran System Restore from Startup Repair. Seems to be similar kind of issue for users with Sophos, but no Sophos here. NOD32 here. Now I’ve hidden kb4493472. Glad to be able to delay these feature updates after 1903, and am hoping I don’t get 1903 for awhile. Actually 1809 is pretty stable now which ironic how I just get a release stable and have to endure yet another release around the corner. With something like a 1/3 of users having got 1809 and the rest on previous releases. Guess maybe its why Microsoft finally caved on letting all Win 10 users pause the feature updates after 1903. I am at a point now, where nothing coming out in these new feature updates is worthy of the mess upgrading my PC’s. Other then a requiring a stable Windows OS, I don’t care for the rest of the stuff Microsoft keeps pilling onto Windows releases. Issue on Windows 7 since last update was installed !! Windows 7,8.1 and Windows 10 are freezing after April patches. The culprit is probably Sophos apps. Uninstall the updates in safe mode or restore from system restore point. The walls are caving in on Windows Update. Like I said before, since the launch of Win 10 in 2015, M$ has weaponized Windows Update to become like malware, eg GWX KB3035583 and Telemetry KB2952664. M$ is probably issuing buggy KB updates for Win 7/8.1 on purpose, in order to push the users onto Win 10 asap. From 2015 until Feb 2017, M$ purposely borked Windows Update for those who had to do a clean install of Win 7/8.1(eg after a hard-drive failure), in order to push the users to upgrade to Win 10. The affected users were forced to manually install 100+ security updates one-by-one from M$ Update Catalog. Hence, from 2016, I have stopped updating my Win 7 laptop = have peace of mind. Of course, I also have real-time AV protection and practice safe-browsing. ……. My main OS is a dual-booted Linux installed on an external USB hard-drive because M$’s Windows Update can sometimes bork a dual-boot system that is on the same hard-drive. KB4493446 won’t install, despite repeated attempts (including a manual install). The other two updates for April 10, 2019 installed just fine, but not this one. it appears the KB4493472 update for Win7 is also causing problems on systems with Avast security software as well. Sophos is no longer the only one affected by KB4493472. I’m running Windows 7 x64 SP1 with Kaspersky Free 2019 antivirus. I “turned off” Internet Explorer in Programs and Features several months ago, and I don’t have any version of Microsoft Office installed. Last night I downloaded and installed this month’s security-only updates using WSUS Offline Update [WOU] with the automatic reboot and recall option. I *believe* WOU’s installer stage went through two reboot cycles (so far as I noticed out of the corner of my eye), staying stuck at a black screen for *quite some time* on the first reboot. (I’ve learned to be patient with those scary black screens, and grateful that my laptop has a hard-drive-activity light.) Upon completion, there were no errors and no warnings of any significance in the install log. I rebooted manually one more time after dismissing the log — something I have learned is useful to avoid OS glitches (at least if you select WOU’s option to automatically display the install log before your personal desktop and settings get loaded, as I do). Once that was done, I ran Belarc Advisor to confirm that no security updates were still missing and Windows Privacy Dashboard [WPD] to confirm that no unwanted diagnostics or telemetry had been reactivated. (I had already updated WPD’s firewall rules a day or two earlier, and the rules were still up to date.) Finally, and most importantly, my computer seems to be running okay. In short, all seems to be well. Ha! Less than 24 hours after I applied my Patch Tuesday updates, an updated version of WSUS Offline Update was released, sometime on 13 April! After reading the release notes, I decided to run another round of updates using the new version. It downloaded and installed updates to C++ and Windows Defender definitions, but no new security-only updates for Windows proper (or updates to Silverlight or Remote Desktop Client, either, for that matter). No reboot was required (although I soon did one for other reasons). All is seemingly still good. A friend of mine ran a single round of April 2019 Patch Tuesday security-only updates using the freshly released version of WSUS Offline Update, and he didn’t run into any problems, either. He also runs Windows 7 x64 Pro SP1 and has also turned of Internet Explorer, but unlike me, he runs Microsoft Office (2010) and a slightly older version of Kaspersky Free (2018). One of my dad’s computers runs Windows 7 x64 Enterprise SP1 and Sophos Endpoint Security and Control (a choice imposed by the institution he works for). I’m going to be turning off Internet Explorer 11 on that computer during my next visit — I set Windows Update to stop checking for updates on it quite some time ago — but I don’t yet know how and when I’m going to install this month’s Windows security-only updates. Hopefully, Sophos and Microsoft are sorting out the problems.